It's that time of year again, the leaves are changing, the presence of hoodies is on the rise and the burning question on everybody's mind seems to be, "What should we expect this winter?" Long range forecasts are used by businesses to manage risk or manage supply of weather-demand products, and they are becoming increasingly important. Some people live for the snow and cold, and some could do without. No matter what side of the spectrum you fall, you likely have an interest of what to expect this winter. Alright, let us dive into the Midwest Weather Winter Forecast for 2016-2017! Full forecast at the bottom of the page. In most winter forecasts the state of ENSO, or El Nino/La Nina is examined and much of the forecast is based on this index. However, this year we are sitting at a neutral state to eventual weak La Nina and are forced to look elsewhere for more clues. Contrary to last year, a lot of the weight was given to the El Nino, this will not exactly be the case this time around. 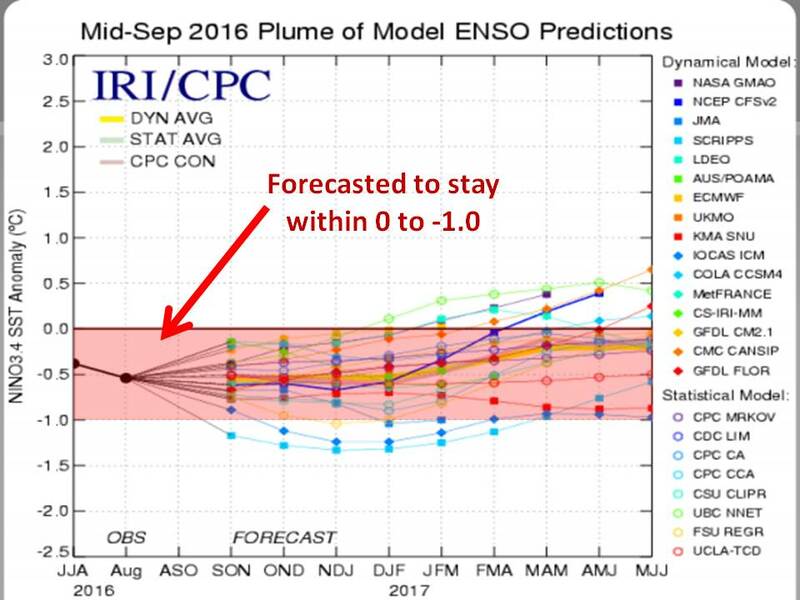 Putting too much emphasis on the projected weak La Nina may prove to be a flaw in other published winter forecasts. We will examine the state of other regions in the Pacific and Atlantic Ocean to help create analog years, or years with similar conditions to use as a proxy for the 2016-2017 season. This process has been proven successful in the past several years for Midwest Weather. And because every year is different, we will look to pick out the major differences and potential factors that will have the largest impact on the upcoming winter. The Pacific Decadal Oscillation (PDO) is a pattern of Pacific climate variability similar to ENSO in character, but which varies over a much longer time scale. 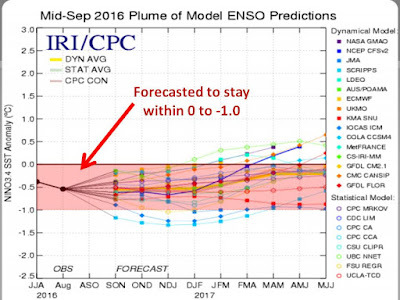 The PDO can remain in the same phase for 20 to 30 years, while ENSO cycles typically only last 6 to 18 months. The PDO, like ENSO, consists of a warm and cool phase which alters upper level atmospheric winds. Currently we are in the positive phase of the pattern and should last through the winter, its effect on the overall weather pattern is a major factor. 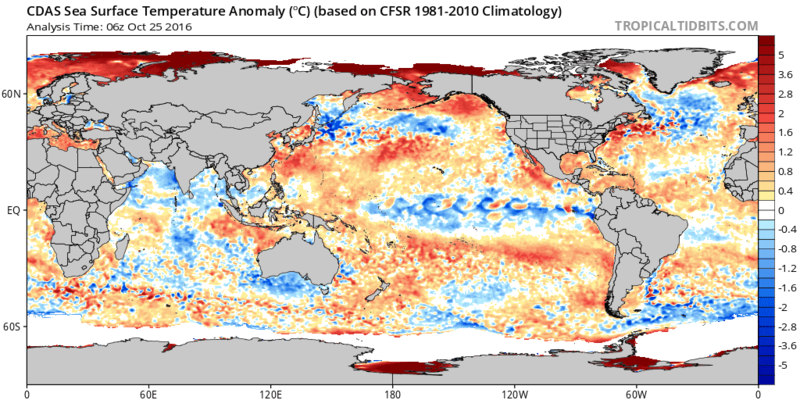 The positive phase of the PDO is described as warmer than average water in the Gulf of Alaska down through the Pacific Coast of the United States. The subsequent result of this warm water is a cold blob of water further off to the south and west, by virtue of ocean currents and areas of up-welling. 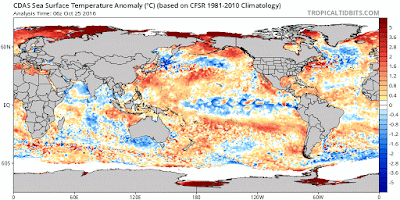 The plot from Unisys shows the SST anomalies resembles these exact conditions. The figure below shows how positive PDO winter have influenced temperature anomalies over the period from 1951-2010. A bit contradictory to the state of ENSO right? This is why we will continue to examine other factors around the globe for the sake of our winter forecast. Models are starting to trend towards a cooler solution for the winter, which coincides with our analogs, but still suggest some spots could still be at or slightly above average. The CFS model, which is a low resolution model that run 4 times a day out to a year, also has an increased chance for slightly above normal precipitation in parts of the Midwest. A more organic method in forecasting is to directly look at the current conditions. For a North American winter, the Arctic Ocean plays a major role in how cold the winter can get, and it's actually counter intuitive. Overall, the forecast suggests a much cooler winter than last year with the potential of more snow for many. Expect several cold spells, yet each arctic blast is not expected to last long. There should be more variability in temperatures from week to week than average, setting up a higher potential for large winter storms to develop. Warm waters (5-6 degrees above average) will prolong and enhance the lake effect snow season. There will also be an increase in Alberta Clipper-like systems that drop a quick 1-3"/2-4" snowfall during cooler periods this winter. Spring may come earlier than usual, even with cooler temperatures through the winter. While only Mother Nature will have the final say, it looks to be a good 'ol fashion winter for the Midwest. Thank you for reading. You can find more by following on Twitter and on Facebook. **Be sure to keep it here to Midwest Weather for updates throughout the winter!